If you love haunted real estate, then touring the gorgeous and spooky Queen Anne Hotel in San Francisco should be on your bucket list. I was there with my extended family as part of a ghost walk in SF some years ago, and found it to be one of the most interesting places in The City. I’m intuitive and have sometimes had experiences that you might call paranormal, though nothing huge – and I’ve never “seen” a ghost. At the Queen Anne Hotel, though, I did feel a large cold spot – and I wasn’t the only relative to do so in that spacious Victorian. Like any good tourist, I snapped some digital photos (and like any decent ghost hunter, I hoped there would be something of interest on the images later). 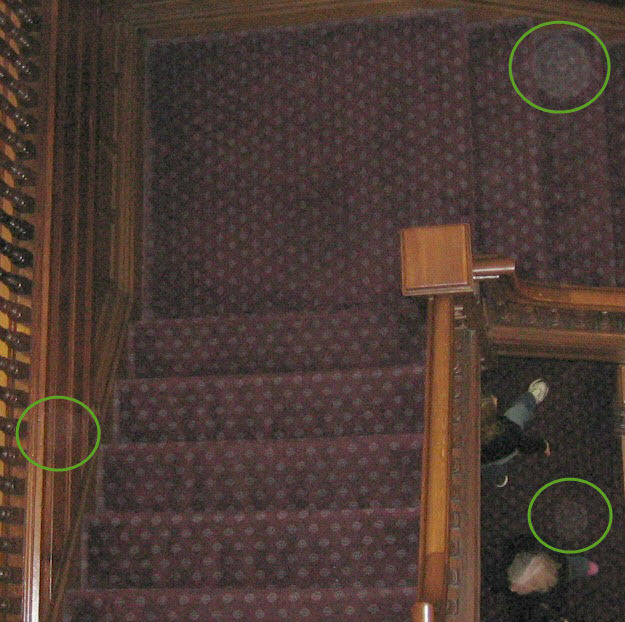 One photograph that I took of the staircase had a least 3 orbs that I can make out. I know, they could be dust…. Here’s the original photo, and after that the same one but zoomed in, with increased brightness, and the 3 orbs circled in green. And next, zoomed in, lightened, with the round white blobs circled. This hotel has been written about numerous times, both because of its charming ghost hostess and because of its history and lovely accommodations. The tour we took, years ago, was via the San Francisco Ghost Hunt Walking Tour, and this lovely inn was only one of a few fascinating stops along the way that we were introduced to by Jim Fassbinder, the owner of the company (there’s a different person giving the tours now, but Jim apparently continues to be the proprietor). I recall that seeing the inside of the hotel was not guaranteed then – and the site listed for the tour does not mention it at all, only that there’s an unnamed indoor location that might be a part of the tour. I’m hoping that if you do the tour, it will work out that you can see the inside of the hotel as part of it, but of course the tour is a lot of fun even without it. Want to hear some real ghost stories? Here’s what you need to do…. Statistics vary, but up to about half the American population believes in ghosts – or at the very least, the possibility that they exist. A CBS poll in 2005 found that 48% of those asked said that they believe in ghosts and 45% said they didn’t. The same query revealed that 56% of women did believe in them. Surprisingly, 22% of those polled (not just of the set that believe) said that they had personally seen or felt a ghost. That’s huge! A Pew Research poll in 2009 found smaller numbers but that 18% felt that they had had some sort of experience with a deceased person. Scientific American calls these “grief hallucinations” and states that 80% of the elderly have them within a month of the passing of a close loved one. This is, of course, a surprising conclusion that the otherwise very respectable magazine failed to prove, but instead merely asserted. Whether real experiences of the dead or, as Scientific American unscientifically claims, why is it that so few people ever talk about it? No one wants to be labeled as crazy, nuts or disturbed. In casual conversation, friends and relatives (even if they believe and have experienced something themselves) are never going to ask, “so have you seen a ghost or felt the presence of a deceased loved one recently?” So it’s a self-imposed “don’t ask, don’t tell”. How do you get past that so that people will share with you? But, if for some reason they are made to feel safe in discussing it – say, if you verbally open that door – you might be surprised at the outpouring of stories. I get them all the time, often weekly. People I don’t know will call or email me about their experience because with this blog they know that they will gain a receptive ear. You can also find a MeetUp group in your area for ghost hunters. Most of them will have a very good, personal, compelling reason for being there. And they won’t be nervous about sharing their experiences with you, either. So if in this Halloween season you want to hear some “real ghost stories”, be daring and bring the subject up or put. Don’t make a verbal avalanche of it, but warm up to the topic a little. “This is a really interesting old house. Are there any stories associated with it?” Or volunteer something true in your own life, like “after my pet died, I really felt her presence for awhile afterward…” Or even, “my relative said that after his wife died…” The more closely it’s connected to you, personally, the safer it will be for others to share their stories and experiences with you in turn. Yes, some people will think you are a little off but most likely you will find someone out there with a story that he or she is just dying to tell. So to speak. There is no charge to attend but donations are gratefully accepted. If you wish to join in the spooky fun, please RSVP to WeAndOurNeighbors@gmail.com. We and Our Neighbors is located at 15480 Union Avenue in San Jose (in Cambrian Park on the Los Gatos border – located at the intersection of Los Gatos-Almaden Road and Union Avenue). Parking is very limited at the site but you can park at the Union School District Office parking lot across the street – the group has permission to use it on weekends for events at the center. In Silicon Valley, one of the main tourist attractions is the beautiful and bizarre “Winchester Mystery House”. This Victorian home has some crazy twists and turns right alongside some exquisite workmanship and fine materials. Though part of it was destroyed in the 1904 earthquake, the majority of it remains as it was a century ago – an engima which fascinates and confounds visitors. Naturally I have been through the house which Sarah Winchester built many times. It’s the kind of thing San Jose area locals visit when out of town relatives come to call. My own experiences have been mixed. I’m mildly to moderately intuitive. There have been times when I definitely felt that something else was there … some sort of presence. At other times, I got nothing. Interestingly for me, I usually come with a camera, and the times when I felt something have corresponded to the times when “stuff” showed up on my digital pics. Likewise, when I didn’t sense anything, I had images without orbs or other anomolies. Tonight I was poking around on the website for the property and found a section called “sightings”. Now it used to be that employees were disallowed from telling anything about their paranormal experiences on the premisis, so I was more than a little surprised to find a record of the bizarre experiences they’ve had here. I guess it’s fair for them to have a 180 on this. So have a look and I hope you enjoy the brief tales as much as I did. Gil Gross, who hosts the afternoon radio program from 2 – 4 on San Francisco’s KGO Radio, had a change of conversational direction today. While discussing and listening to stories about the multiple, devastating tragedies on Sept. 11th 2001, one of Gil’s callers (a widow from that day) relayed having an experience after the death of her husband that convinced her that he was sending her a message of hope. It was a very moving call, and Gil invited others to share any similar experiences. It’s really not often that mainstream radio or other media will be open to this type of conversation, unless it’s at Halloween (and then there are a lot of giggles). Instead, this was a very serious sharing by all kinds of listeners, many of them skeptics themselves until they’d had some sort of experience of a loved one after death. Although my radio track record is pretty much limited to having been a college DJ at a small school in Spokane (Gonzaga U “KZAG, the voice of Gonzaga”), I do know that radio personalities and their producers do not want to risk offending people (and their advertising dollars) and they don’t want to cause eye-rolling and dial switching. So it’s a bit gutsy for Gil and his producer to just go with the flow today and encourage & take those calls. Not only that, but it was handled very well, in a very supportive way that was neither sappy nor skeptical, but open and intelligent. I don’t think that Gil could have done a better job with this highly sensitive topic on an emotion-charged day. The synopsis of today’s program really does not do it (or Gil) justice as it not only sidesteps this very interesting segment of today’s show, but actually fails to mention it at all. I wouldn’t say that this element was so important that it overshadowed weighty interviews or the more “meaty” element of talk radio, but it was a dimension seldom broached and it should have been noted in the synopsis. That’s OK, we’re mentioning it here. Kudos to Gil and to his producer too (my apologies, but I didn’t see the name of that producer online). Want to hear the pocast? It’s online – enjoy! Since I get a lot of spam, please be sure to write something in the subject line that references what the email is about. Thanks! Want to live in a ghost town – for free? Powered by WordPress and WordPress Theme created by Mary Pope-Handy with Artisteer.